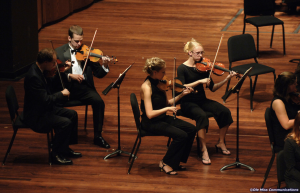 The UM Department of Music offers students the opportunity to study with gifted, nationally and internationally recognized faculty while pursuing their undergraduate or graduate music degrees. Undergraduate students may choose to pursue either a Bachelor of Arts Degree in music or a Bachelor of Music Degree. Students choosing a career path in the Bachelor of Music Degree may specialize in one of the areas of emphasis: music education or music performance. Master of Music students can pursue emphases in choral conducting, ethnomusicology, music education, music performance, music theory, or musicology. We also offer a doctoral degree specializing in music education. The program leading to the Ph.D. in music with emphasis in music education is designed for students who wish to pursue advanced study in preparation for university teaching, research, and other leadership roles in music education. For more information regarding the Master of Music degree in music education and the Ph.D. in music with an emphasis in music education, click here.